2. How does SpamExperts work? 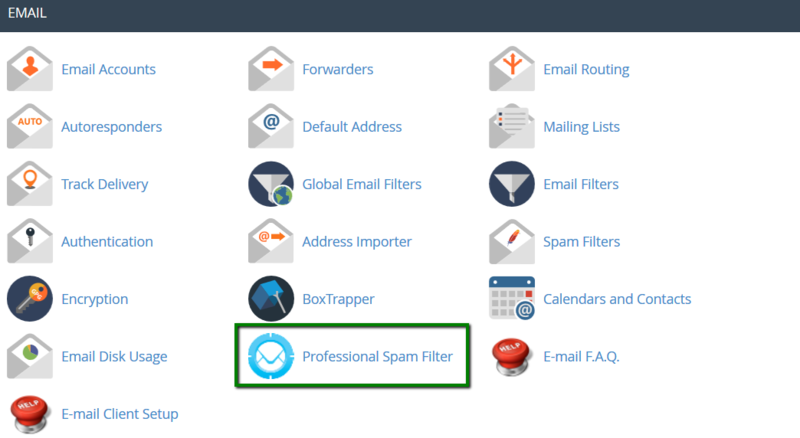 SpamExperts is a user-friendly email filtering solution that allows protecting your account from both incoming and outgoing spam. One of the benefits of SpamExperts is that the suspicious emails are stored in the Spam Quarantine, so the users can easily manage the emails and mark them as legitimate or suspicious ones. NOTE: At this time Namecheap Spam Protection is enabled on some of our shared servers. Also, it works for our Free Email Forwarding. However, we plan on implementing it for all mail services we provide in the nearest future. With SpamExperts enabled for the domain, all incoming emails are automatically routed through the SpamExperts filtering system before reaching mail server you actually use. If the email is defined as spam, it will be either discarded or placed into quarantine. In case the email is valid, it will be delivered to the email account in question. NOTE: The exact shared server to forward mail to is determined by the hostname/IP address specified in email route settings. By default, if you haven't changed MX records for your domain after hosting account setup, the mail server will be determined by A record for sub-domain mail.domain.com (this is a default route set in SpamExperts settings). In case this sub-domain is pointed to third-party IP address by means of A record it's possible to adjust routing in SpamExperts settings to server hostname, IP address or domain (hostname) that is pointed to our server. If the hostname specified in email route settings is pointed to the third-party IP address, the email will not be delivered to your mailbox: it will be either rejected by that third-party server and the sender will receive a bounce back email, or the email will reach the server but the sender will not get any notifications about undelivered email in this case. NOTE 1: These changes will be performed automatically for the domains with the local DNS zone and local Mail Exchangers only. NOTE 2: It is still possible to use third-party nameservers (or use CloudFlare nameservers with our hosting) and mail service in cPanel with SpamExperts. In order to make it work, you need to set up the same MX records from the side of your DNS provider and have SpamExperts enabled in cPanel for your particular domain. If you see this warning, contact our HelpDesk and we will do the necessary configuration from our end. Now, let's take a closer look at each component of SpamExperts Account. In the Configuration tab, you can set the Timezone for the SpamExperts interface and select the desired date and time format. 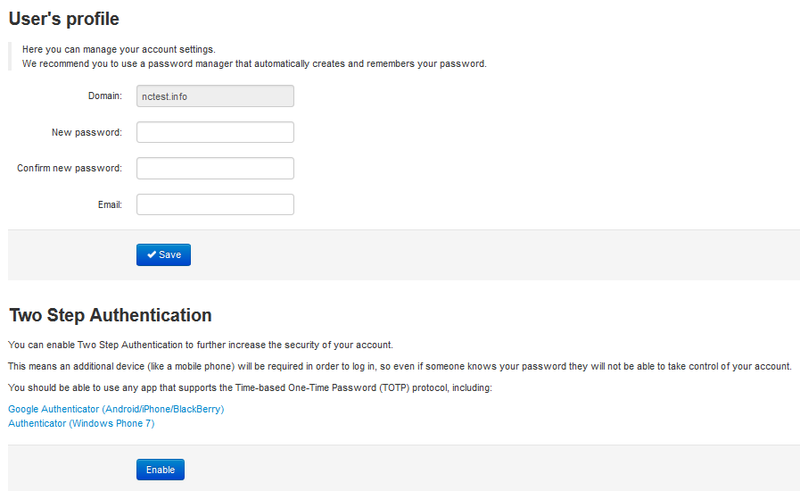 The rest of the settings in this tab are already configured to work with your account. Therefore, we recommend keeping them as they are. 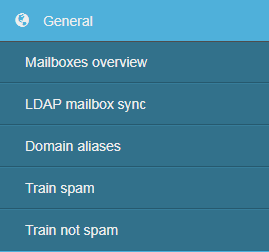 In the Mailboxes tab, you can manually add the mailboxes that are already created in your cPanel. This is not a required action but is helpful if you would like to configure some settings separately for certain mailboxes and be able to log in to your SpamExperts interface as a mailbox user. The Mailbox aliases tab cannot be used for configuring aliases for your cPanel mailboxes. Instead, you can set them up as described in this article. The features of this menu cannot be used on Namecheap’s Shared Hosting servers. This menu cannot be used for setting up domain aliases. Instead, you can set them up as described in this article. PLEASE NOTE: You can upload any .eml file you consider as spam, but if it never passed through SpamExperts filter before then you will receiving a warning: The message you have uploaded never passed through our spamfilter. Feel free to disregard this warning and proceed with .eml file upload. 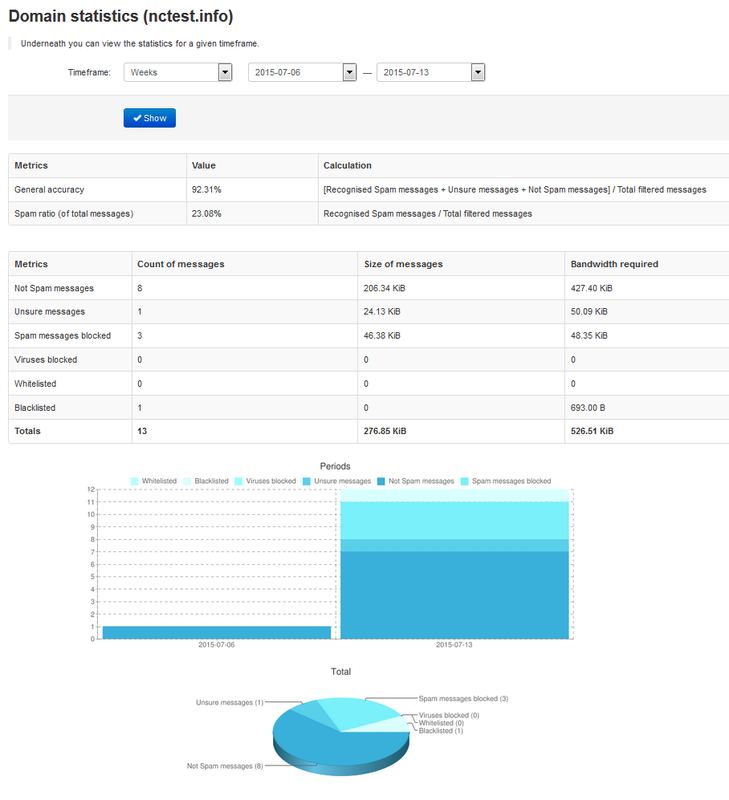 With the help of Log search it is possible to view the log of received, blocked or temporarily rejected emails. You can search the log for the incoming email based on such criteria as subject, sender and recipient of the email, sender/hostname, destination IP and others.Once the necessary options are inserted, click on Start search to get the logs. NOTE: By default the connections logged are accessible for the last 28 days. The detailed classification of the reasons connected with rejected or temporarily rejected emails can be found here. 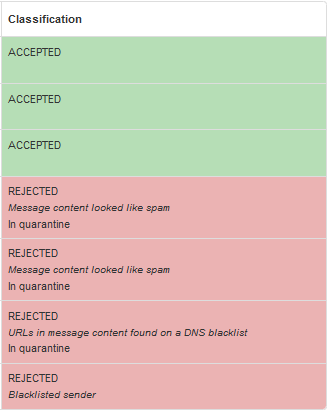 NOTE: You can find and train the rejected emails in Spam quarantine section (more details can be found in the next section). In case the spam email has been accepted by SpamExperts, you can report these emails as spam as described here. Release and Train option will deliver the email to the recipient and train it as not spam in SpamExperts system. Release option will release the email from the quarantine and it will only deliver it to the necessary recipient. Release and Whitelist option will deliver the email to the intended recipient and automatically add sender's email address to Sender Whitelist. Remove option will delete the email from quarantine. 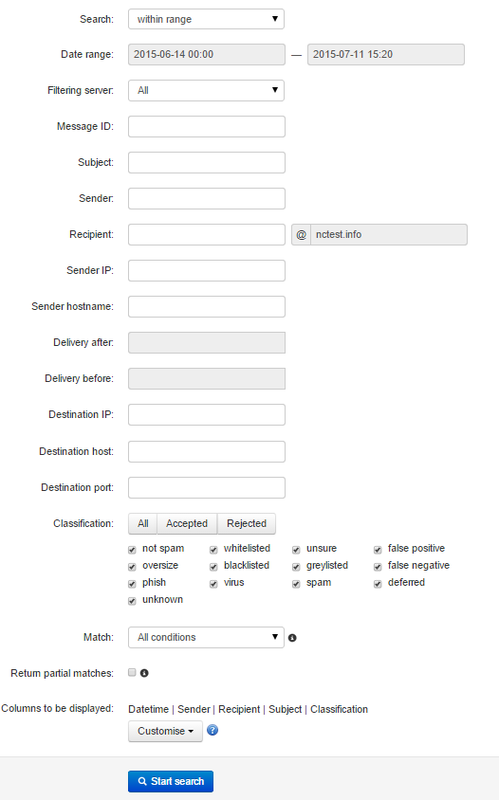 Remove and Blacklist option will delete the email and automatically add sender's email address to Sender Blacklist. Also, it is possible to check the reason for the blocked email, simply look for Evidence line in the raw header and then compare it with logs from classification page. At the top of the raw headers page you can find the option Download as .eml that allows you to download that specific spam email in .eml format so that you can afterwards report it as spam and train the spam filter. 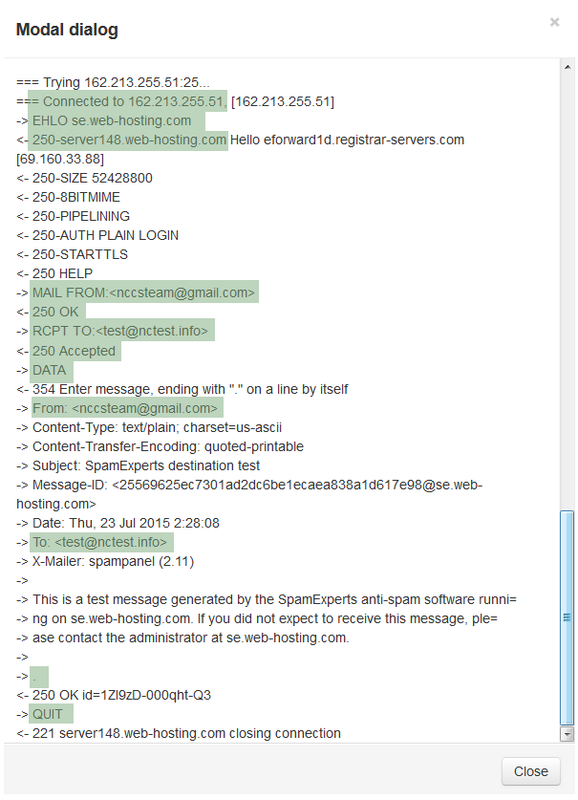 NOTE 1: Unlike the other spam protection systems, SpamExperts stores all mail logs and spam emails on its own server. Thus, at the moment the only way to check incoming spam emails of your email account is to access SpamExperts account itself. NOTE 2: The emails released from the quarantine are delivered to the mailbox, however, you will keep seeing the email in question in SpamExperts web interface and it is how it is supposed to work. Since this is not a Quarantine menu but a Search menu used for logs search and search through quarantine itself. Force retry option will retry to deliver the email. Delete option will delete the email from the queue. Delete and report as spam option will delete the email from the queue and report it as spam to the training server. Error details option will check the reason why messages are stored in Delivery Queue. View option will allow you to check the headers of the queued email. In such a way, all the emails sent to test2@nctest.info email address will be automatically redirected to test@nctest.info account. Note, that it is impossible to send emails from an alias address. For these purposes you will need to create a fully-fledged email account in your cPanel per this guide. 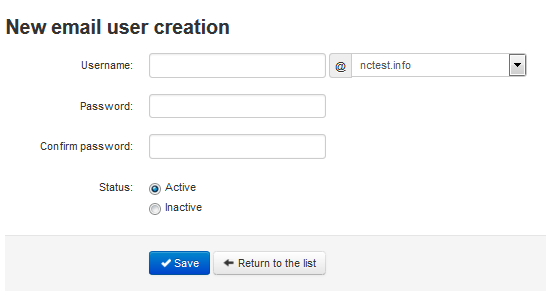 Thus, if you send an email to test@nctutotial.com, it will be delivered to test@nctest.info account. Note, that alias domains don’t have separate access to the webmail. Set Primary Contact Email for your domain. 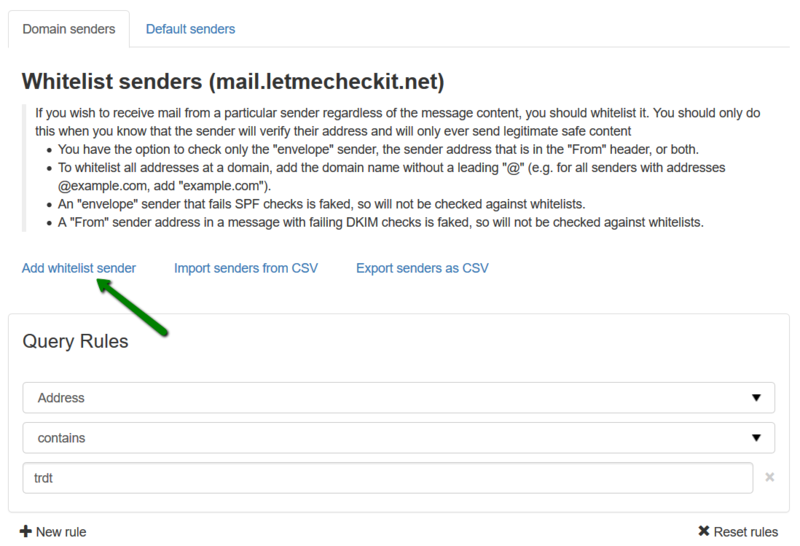 Enable Email notifications From address that will allow you to get notifications from this email address (e.g. when the particular email is put into quarantine). 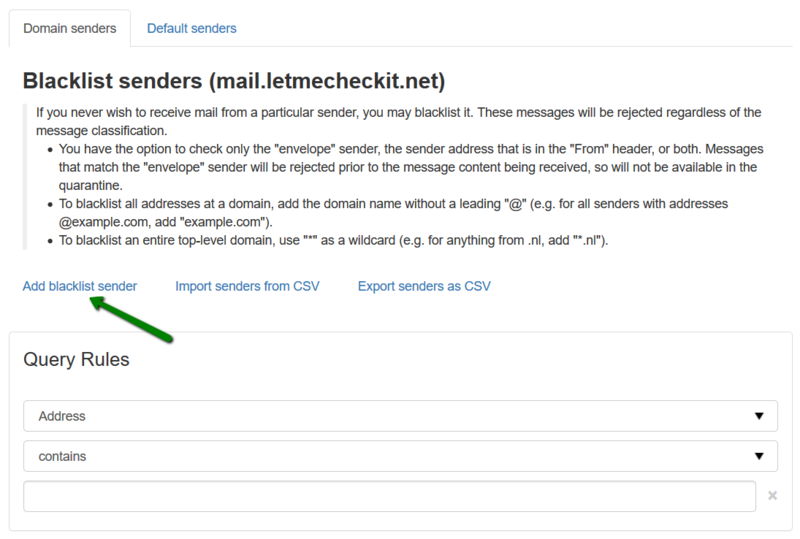 Enable or disable logging for invalid recipients option allows or does not allow the selected domain to log details of incoming mails addressed to incorrect recipients. NOTE 1: A domain always needs to have at least one route in order for the filtering machines to deliver the clean emails, therefore, you are not allowed to remove the only route in this section as the new one should be created first and then you will be allowed to remove the old one. NOTE 2: If there are temporary problems with the first route, the system will automatically try to deliver the email to the second one, then the third one and so on. In case there are permanent failures with a route, the emails will be put into the email queue and SpamExperts will not try the next route. Therefore, it's crucial to have the hostname indicated in route resolved to the correct IP address. NOTE 3: It is possible to change the order of your routes by drag-dropping them to the right position in the list. 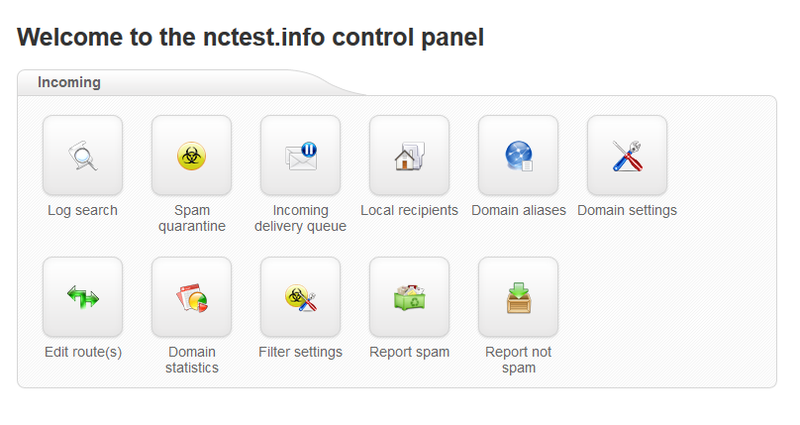 In the example above an email is sent from nccsteam@gmail.com to test@nctest.info. 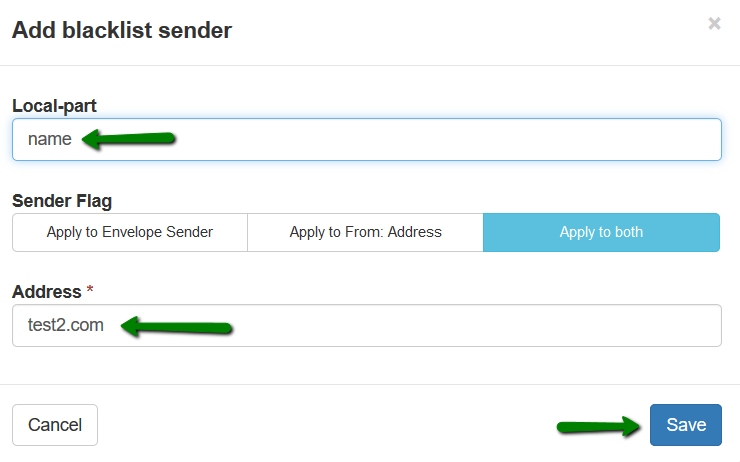 The senders e-mail address is specified by the MAIL FROM command and the recipients e-mail address is specified by the RCPT TO command. MAIL FROM command also tells the SMTP server that a new mail transaction is starting. This command is usually sent as the first command after the identifying and login process. 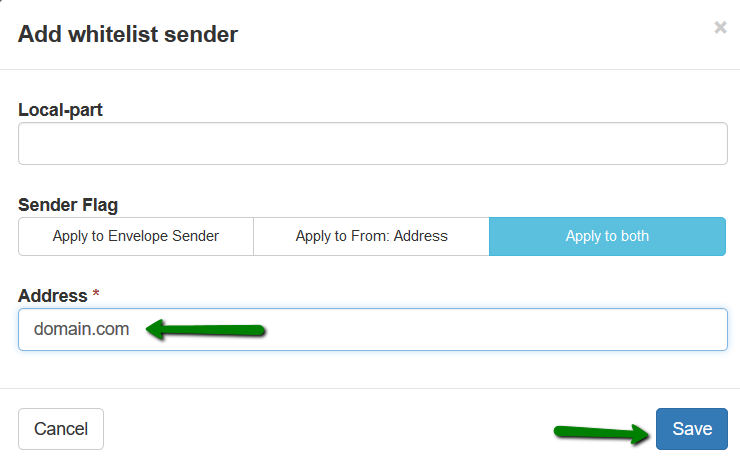 When the sender's e-mail address is accepted the server will reply with a 250 OK reply code (like in our example). The DATA command informs the server that now will the message data be sent (e-mail header, body text etc). The single dot below the message contents informs the SMTP server when the message data ends. After a single dot has been sent to the server and the server has responded, a QUIT command is sent to terminate the session. In this section you can control filter settings for the domain and its users. If the Quarantine enabled option is turned off, the spam emails will be delivered to your inbox and will not be kept in the quarantine system. Quarantine threshold: set a minimum score that email must get in order to be classified as spam by the content analysis portion of the filter. The score ranges from 0.0 (certainly not spam) to 1.0 (certainly spam), so the higher this is set, the more likely you are to receive false negatives, and the less likely you are to receive false positives. It is set to 0.85 by default in order to avoid any possible mail delivery issues. Beneficial to train threshold: set the minimum score that email must get in order to be classified as unsure (and therefore notated) by the content analysis portion of the filter. The score ranges from 0.0 (certainly not spam) to 1.0 (certainly spam). This must be lower than the spam threshold. The default value is set to 0.3. SPF Sender Policy Framework: SPF is a common technology that allows the sender to indicate which IPs are allowed to deliver the email from the sender domain. This check can be disabled by ticking the box, however, it is recommended to make it enabled to block spam. DKIM Domain Keys Identified Mail is an email authentication method designed to detect email spoofing. It is recommended to enable it. DMARC Domain-based Message Authentication, Reporting & Conformance is designed to give receivers of email better judgement control based on sending domain reputations. It is disabled by default. Skip maximum line length check: there are strict regulations on allowed line length in emails, which are automatically enforced by the email software. Some applications or badly developed scripts do not adhere to the official specifications thereby exceeding the maximum allowed line-length. This check can be disabled by ticking this box, however, we recommend to keep it enabled to block spam. Beneficial to train notation: pre-pend this tag to the subject of emails which the filter could not strongly classify as not spam or spam. You need to leave this field empty not to prepend the emails. 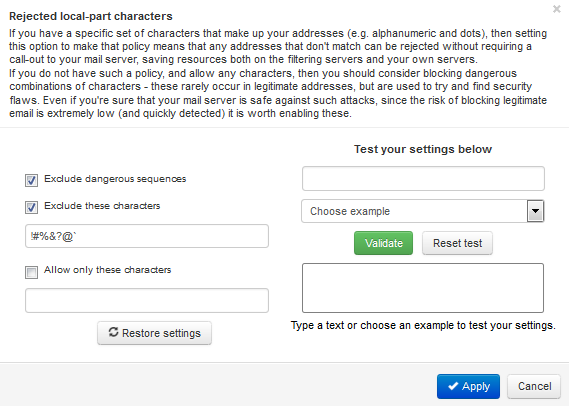 It is necessary to ensure the email are considered legitimate emails, you can use this tag to have them stand out and to report them as spam/not spam to further improve the effectiveness of the filter. NOTE: You can upload any .eml file you consider as spam, but if this email has never passed through SpamExperts filter you will get a warning The message you have uploaded never passed through our spamfilter. Feel free to disregard it and proceed with .eml file upload. NOTE: You can upload any.eml file you consider as ham, but if this email has never passed through SpamExperts filter you will get a warning The message you have uploaded never passed through our spamfilter. Feel free to disregard it and proceed with .eml file upload. If the email contains the file or attachment with blocked extension, the email itself will be blocked too and placed in Spam Quarantine. 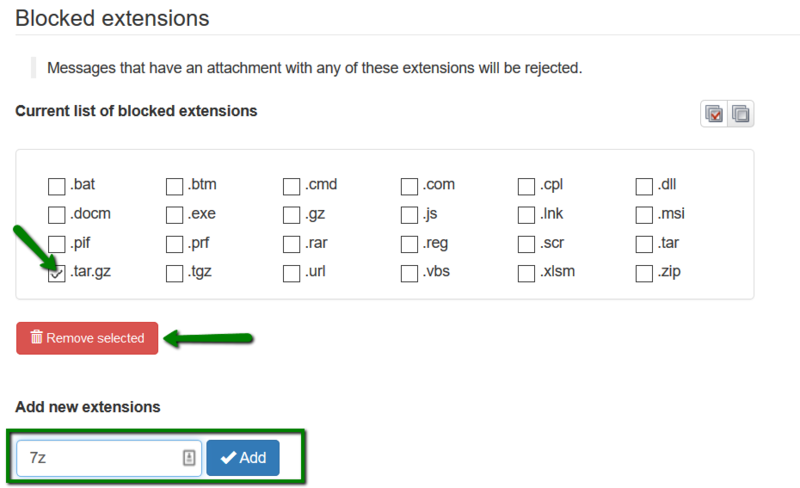 To allow receiving extensions from the blocked extension list, select the extension and click the Remove Selected button. 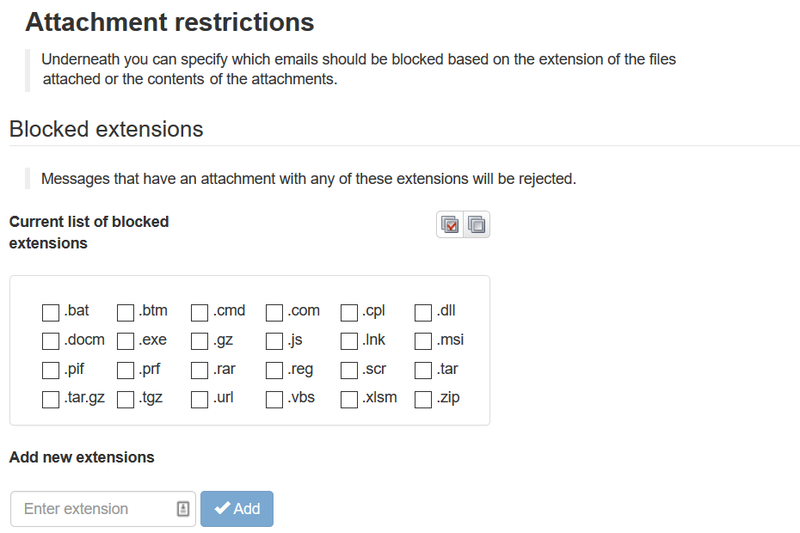 Disallowed release extensions: email users will not be allowed to release messages that contain attachments with these extensions. Restriction options: to block password-protected archive attachments, potentially unwanted attachments and attachments that contain hidden executables. Additional restrictions: link limit size and maximum MIME defects. Scanned link extensions list: if 'Message link size limit' is set, then links in messages to files with these extensions will be scanned for viruses and other malware. 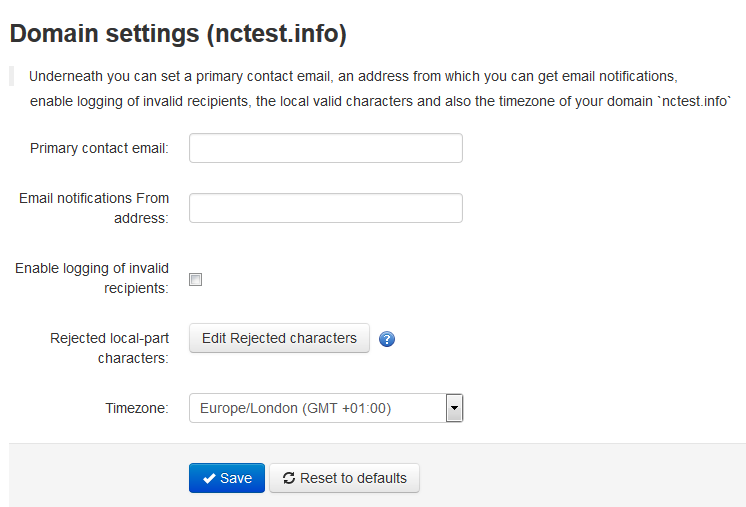 In this section you can specify the maximum email size limits for incoming and outgoing emails. Keep in mind that the server limit is set to 50 MB, thus, it is not possible to exceed this limit even using the No limits feature. This menu allows you either to whitelist or blacklist sender's email address or a full domain. All spam filtering checks are disabled both for whitelisted and blacklisted senders. Emails sent from the whitelisted senders will be surely delivered to the Inbox folder of your email account, while incoming emails from senders listed on the blacklist will be automatically rejected. Note, that such messages will not be quarantined, but rejected with a 5xx SMTP error code, so legitimate sending SMTP servers will generate a bounce message to the sender. On this page you can create and manage email users, connected with your domain name. Edit the user details (username and password). Delete email account from SpamExperts Dashboard. As a higher level user, you have ability to Login as user to particular account. Enable Two-Factor authentication for user. GET method is used for viewing data. POST method is used for new entries creation. PUT method is used for existing entries modification. DELETE method is used for entries deletion. During account transfer from one server to another one, it is very important to keep your mail service working and SpamExperts filtering and routing your emails to the new server (if your hosting account is already activated there. In order to achieve this, it is necessary to perform one basic step: to make your route on the old server use the hostname or IP address of the server your account will be moved to. Once your account is transferred to the new server you need to make sure that email route settings are updated as well, otherwise SpamExperts will filter the emails and forward them to the old destination mail server indicated in email route, where account is no longer active. As a result, the sender will get a bounce back message that a sent email has not been delivered. After that you will have two routes that SpamExperts may use (with the old and new destination mail servers). If your new account is already active on the new server, it is recommended to delete the old email route. Also, you will need to check if the correct hostname (IP address) is indicated in email route settings on the new server. In case mail should not be routed through SpamExperts filter, you can change MX records for your domain to point to shared server (if you wish to use cPanel Webmail service without SpamExperts) or any other server directly (if you prefer using third-party mail service).